Today on the blog I'm featuring my engagement session with two adorable people, Aubree & Ray! 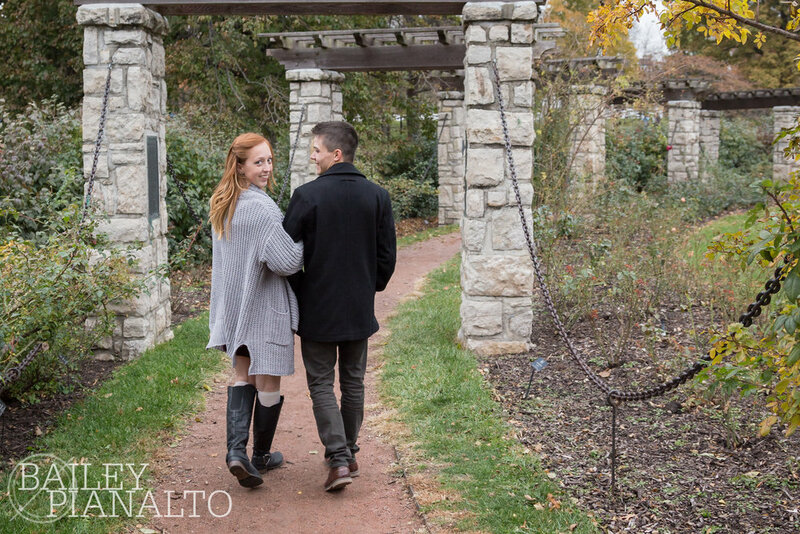 We had a *chilly* afternoon on our hands for this session, but Aubree & Ray were absolute troopers! They held each other tight and kept each other warm throughout our entire time together and never once complained. I tried to keep their coats on as much as possible, then toss them to the side right when I was ready to take the shot! Second, we moved south to Loose Park (after a quick outfit change and warm coffee at PT's :) ). We were in luck! Some of this fall's most beautiful foliage was still on display at the park. We may have had to fight a few families for our spot among the leaves, but everything worked out great. Loose Park is an absolute gem for photography; there's a reason it's so popular! Check out some of my favorite photos from my session with Aubree & Ray! Congratulations again to Aubree & Ray! You are going to have the most amazing and loving lives together, I just know it!